Creating folder in a SharePoint document library is one way to group and manage files. Folders can be created from your device when syncing or from the command bar on the web. 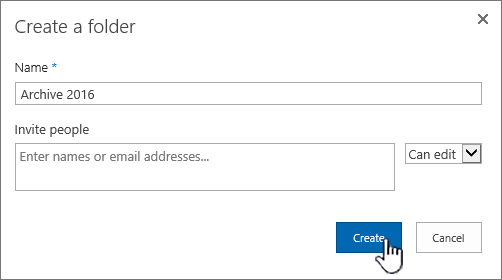 Go to the SharePoint site and open the SharePoint document library where you want to create a new folder. On the menu bar, click + New and then click Folder. If you don't have folders as an option on the + New menu, they may be turned off. A library owner or a user with design permissions can set whether the Folder command is enabled or not. 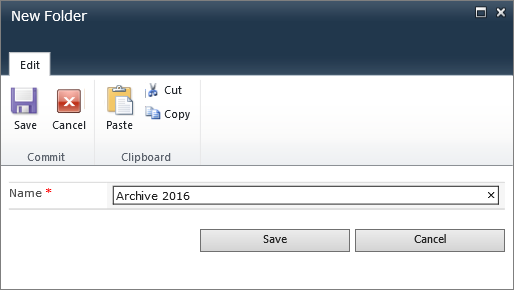 See Turn folders on in SharePoint Online. Note: Does your screen look different than this and you're using SharePoint Online or ? Your administrator may have SharePoint Classic experience set on the document library. 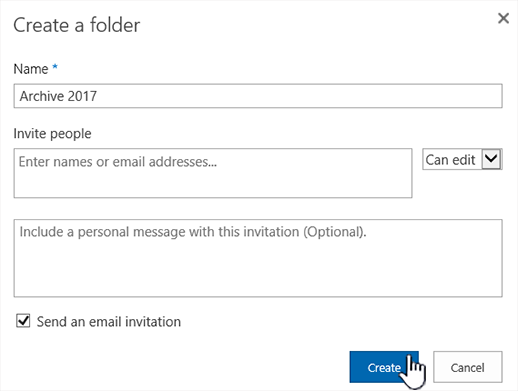 If so, see Create a folder in a SharePoint Classic experience library below. In the Folder dialog box, type a folder name in the Folder Name box and then click Create. Note: To change the folder name later on, click the ellipses ... , and then click Rename. Change the folder name in the Rename dialog, and then click Save. For more info, see Rename a file, folder, or link in a document library. When done, you should see your new folder in the document library and can start adding files or creating subfolders within it. To add a new file, see Create a new file in a document library. 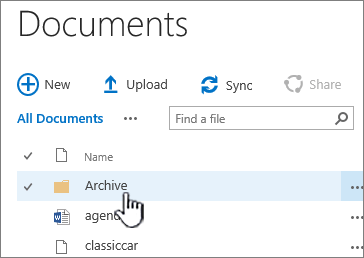 To upload existing files, see Upload a folder or files to a document library. If you don't see your new folder in the library, refresh your browser. In some cases, you might consider using views instead of folders. Files in views can be filtered, grouped, and sorted. If you have a large library, a combination of views and folders might work best. Open the library where you want to start adding folders. Click Settings and then click Library Settings. In the Folder section, make sure that the Yes option is selected for Make "New Folder" command available. Click OK and navigate back to your library. 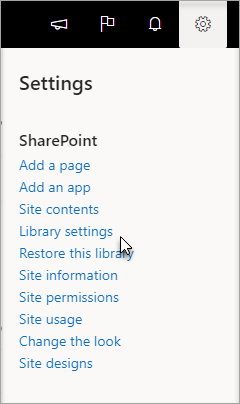 Go to the SharePoint site containing the SharePoint library where you want to add the folder. Click the title of the library on the Quick Launch bar to open it, or click Settings , and click Site contents, and then click the title of the library you want to add folders to. Note: Designers can modify the appearance and navigation of a site significantly. If you cannot locate an option, such as a command, button, or link, contact your administrator. In the Ribbon, click Files, and then in the New group, click New Folder. Note: If the New Folder command is not available, you can turn it back on with the proper permissions. On the Library tab of the ribbon, click Library Settings, and then click Advanced settings. In the Folder section, make sure that the Yes option is selected for Make "New Folder" command available. Note: To change the folder name later on, click the ellipses ... , click the ellipses ... in the dialog box, and then click Rename. Change the folder name in the Name box and then click Save. In the Create a folder dialog box, type a folder name in the Name box, and then click Create. You can optionally invite people to share the folder. For more info, see Share files or folders in Office 365. Depending on your situation, you might consider using views instead of folders, because they enable content to be filtered, grouped, and sorted in multiple ways. If you have a large library , a combination of views and folders might work best. For more info on views, see Video: Create and edit public views of a list or library. By default the New Folder command is turned on in SharePoint document libraries. A library owner or a user with design permissions can set whether the New Folder command is enabled or not. Go to the site containing the SharePoint document library where you want to add the folder. In the Ribbon, click the Files tab, and then in the New group, click New Folder. Notes: If the New Folder command is not available, you can turn it back on with the proper permissions. On the Library tab of the ribbon, click Library Settings, and then click Advanced settings. In the New Folder dialog box, type a folder name in the Name box, and then click Save. Click Create when you're done. To change the folder name later on, click the ellipses ... , click the ellipses ... in the dialog box, and then click Rename. Change the folder name in the Name box. If you don't see Rename, click Edit Properties, and change the Name field. Click Save when done. To quickly go to the next level up in the folder hierarchy, in the Ribbon, click the Library tab and then click Navigate Up. Depending on your situation, you might consider using views instead of folders, because they enable content to be filtered, grouped, and sorted in multiple ways. If you have a large library, a combination of views and folders might work best. For more info on views, see Video: Create and edit public views of a list or library. By default, the New Folder command appears in SharePoint document libraries. A library owner or a user with design permissions for the library can set whether the New Folder command is enabled or not. Navigate to the site containing the SharePoint document library for which you want to add the folder. Click the name of the library on the Quick Launch bar to open it, or click Site Actions, click View All Site Content, and then in the appropriate libraries section, click the name of the library. 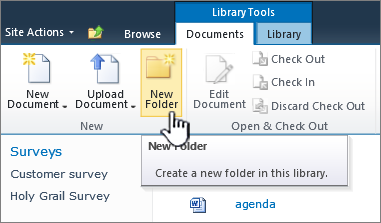 In the Ribbon, in the Library Tools section, click the Documents tab, and then in the New group, click New Folder. Note: The person who created your library may have specified that folders cannot be created in the library. If this is the case, the New Folder command is not available. In the New Folder dialog box, type a folder name in the Name box, and then click OK. Note: To change the folder name later on, click the down arrow on the line with the folder, and then click Edit Properties. Change the folder name in the Name box. Depending on your situation, you might consider using views instead of folders, because they enable content to be filtered, grouped, and sorted in multiple ways. If you have a large library , a combination of views and folders might work best. For more info, see Create, change, or delete a view. 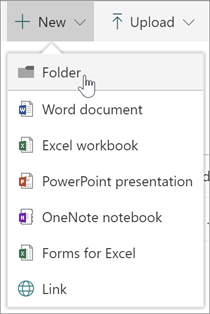 By default, the New Folder menu appears in SharePoint libraries. A library owner can determine whether the New Folder menu is enabled or not. If the SharePoint document library isn't already open, click its name on the Quick Launch bar to open it. On the New menu , and then click New Folder. Type in a folder name, and click OK. If you're not sure which version of SharePoint you have, see Which version of SharePoint am I using?. Was this article helpful? Was it missing content? If so, please let us know what's confusing or missing at the bottom of this page. Please include your version of SharePoint, OS, and browser. We'll use your feedback to double-check the facts, add info, and update this article.